The Advertising Standards Authority (ASA) has recently clamped down on a number of universities for making misleading claims in their marketing. According to the BBC, six universities have been told that they must remover their statements, and the ASA has said that it will shortly be issuing guidance to the higher education sector on what sort of information should and shouldn’t be used in marketing. The driver behind some of the outlandish claims being made is the increase in competition amongst universities, especially in the light of tuition fees and the lifting of the cap on student numbers. Universities are having to compete with one another to attract students far more than they did in the past, and this has unfortunately led to claims being made that are either inaccurate or unsubstantiated. As the director of the Higher Education Policy Institute, Nick Hillman commented, this has led to the sector having “a touch of the Wild West about it”. It is clear that universities are looking for ways of differentiating themselves from others, yet it is equally clear that making unsubstantiated and sometimes untruthful claims is not the way to go. As Guy Parker said, young people do not need to be misled, but instead need “good evidence”. So what is a university to do? One way a university can give the kind of good evidence Mr Parker is talking about is to demonstrate to would-be students the link between the courses they offer and the career options this can lead to. This does not mean making outlandish claims like “By doing such and such course, you will get to do the career of your dreams.” Rather, it means simply joining the dots between potential careers out there and the courses on offer at the university, linking the two by offering realistic and objective insight. For example, one of the claims that fell foul of ASA’s standards was this: “We are the UK’s number one creative university.” This is a statement that is practically impossible to verify, since there are a number of criteria – some of them subjective – which would need to be satisfied in order to substantiate the claim. What makes you the number one creative university? Quality of teaching? Variety of courses? Destinations at the end? Something else? It’s all a bit vague. However, imagine if the university making this claim were to take a different route. Instead of talking about being the number one university for creative arts, wouldn’t it be more compelling if they were to show people how the course they are thinking of undertaking, in addition to being a good educational experience in itself, can also give them a route into employment? This approach is surely the sort of “good evidence” that Guy Parker is calling for. It is not making any grandiose claims about being the best university in the country for Graphic Design. 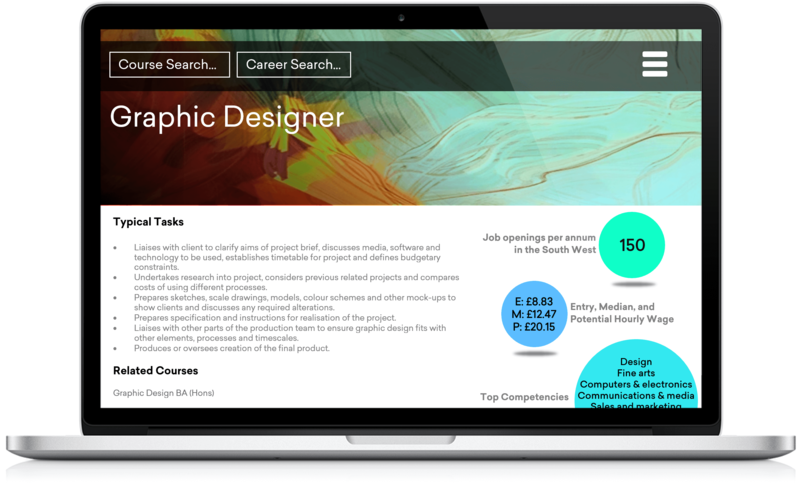 It is simply giving objective insight about demand, wages and skills for Graphic Designers in the university’s region, and linking it back to the course(s) on offer. In other words, it is all about helping people to make more informed decisions.